Charles is the recipient of the 2018 Leonard Bernstein Award. 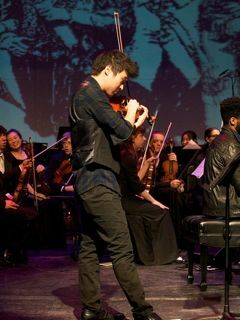 Charles Yang performed most recently on Show 364 in Beaver Creek, CO as both the episode’s Guest Host and violinist. He has also appeared on Show 346 in Boston, MA on October 1, 2017 as a member of Time for Three; Show 303, recorded in Interlochen, MI, on March 13, 2015; Show 74, recorded in Austin, TX, on October 19, 2002; Show 230, recorded in Monterey, CA, on April 7, 2011; and Show 286, recorded in Cincinnati, OH, on April 2, 2014. Charles Yang, recipient of the 2018 Leonard Bernstein Award has been described by the Boston Globe as one who “plays classical violin with the charisma of a rock star.” A graduate from the Juilliard School, Mr. Yang began his violin studies with his mother in Austin, Texas, and has since studied with world-renowned pedagogues Kurt Sassmanshaus, Paul Kantor, Brian Lewis and Glenn Dicterow. He first appeared on From the Top as a 14 year-old and has been featured on radio, PBS’ “From the Top at Carnegie Hall” and numerous other From the Top projects ever since. He has performed as a soloist with orchestras and in recitals in the United States, Europe, Brazil, Russia, China, and Taiwan, and is the recipient of numerous awards and honors. 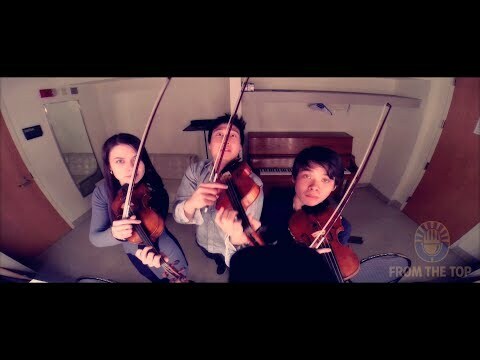 On June 9th of 2005, the Mayor of Austin presented Mr. Yang with his own “Charles Yang Day.” He joined the genre-defying trio, Time for Three in 2016. Visit his website at charlesyangmusic.com.